Hydrosmart is one Adelaide water technology company leading by results. They make a chemical-free water treatment process using truly sustainable technology that conditions water through computer- generated resonance frequencies. Hydrosmart disrupts the electron bonding system of minerals and compounds and breaks them down in much the same way that soundwaves can shatter a glass. This makes it globally unique in that it treats water of all types to solve problems cheaply and sustainably as no filters, chemicals or membranes are needed and there are no other operational costs after installation. Hydrosmart is easy to install and maintenance-free, there are no consumables or ongoing costs. Over a decade of use around Australia and Asia, increasingly being adopted around the planet, it is solving agricultural, industrial and domestic problems without producing waste or a large carbon footprint, making it an exciting approach worth examination for your water or wastewater problems. Clients include the likes of BHP, which uses units on all new houses being built in the mining towns of Newman and Port Hedland in Western Australia, for its antiscalant and water-softening abilities. Bunbury Golf Course WA uses it for effective iron removal and prevention of its irrigation lines and sprays, Mount Barker Strawberries have used it for over many years to manage salinity issues with improved taste, health and fruit size as Table Grape Growers Australia used it to strip out an inch of deposited minerals from 8 inch pipes and drippers. Taking a new direction, Hydrosmart management has been pursuing the need for greater scientific research into its non-chemical water treatment to support the many good outcomes being achieved anecdotally by its clients. 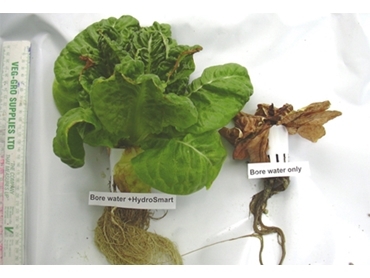 Scientists at Suntec NZ ran Hydroponic trials using bore water very high in salts. As lettuce like sodium levels at approximately 40 ppm and a combined TDS of no more than 900 ppm, it was decided to commence with sodium levels at 1150ppm with the combined TDS of above 4,000 ppm it became swiftly apparent that the two varieties growing in Hydrosmart treated water were far more able to handle these very high levels - in most cases right up until harvest time. A report was completed which is aimed at being published soon. Summer 2012 scheduled trials are into flavour enhancement via better mobilisation of minerals and nutrients into plants using treated mineralised water. A second trial was completed at Flinders University S.A on scale control. The calcium carbonate trial was run by Dr. Bob Moore to assess calcium carbonate in treated water using Hydrosmart’s resonance frequencies. The trial confirmed an increase in particles in the treated tanks where scale-forming bicarbonates were found to be, which is in accordance with the technology's consistent commercial descaling history in both hot or cold flows in water with a mineral content as high as 100,000 ppm. Further trials are now being undertaken to better understand how it is that plants grown in highly mineralised water are healthier and produce better fruit and yields.